The first of EMC’s own recordings, Fifty in Two Thousand is a 75-minute systemic piece for piano, prepared piano, electronic keyboard and percussion, coming to you in plain EMC purple livery. £10 p & p.
Far from the ‘forbidding, hermetic’ piece implied by his commentary, this quietly alluring music possesses the seemingly incidental beauty that can arise in music composed under self-enforced constraints. It does lean, as Hobbs remarks, ‘toward the meditative and uneventful’, but the games it plays with time are constantly diverting. The electronic keyboard sounds at one moment like chiming clocks, at others like a giant toy piano. The percussion rings out potentially interminable patterns. The piano lilts and muses, illuminated by the glow of decaying notes. These elements are dovetailed expertly, following those preconceived procedures, and by the piece’s end another potential hour and a quarter has taken on its singular shape. English experimental music has been simmering away quietly for more than three decades. The movement, which is associated with characters such as John Tilbury and Cornelius Cardew, plus many offshoots such as the Portsmouth Sinfonia, was enshrined in Michael Nyman’s 1974 book, Experimental Music: Cage and Beyond. What emerged tended to involve non-musicians and professional players working together, a more democratic relationship with the audience and messy happenstance. And though the music is avant garde, with a stubborn streak, it is rarely ugly. It has a take-it-or-leave-it quality, both unsettling and calming; its influence upon ambient music has been enormous. Many of the experimentalists have continued in their subversive, gentlemanly way: John White, Howard Skempton, Michael Parsons, Gavin Bryars and Dr Christopher Hobbs, who has just released Fifty in Two Thousand (Experimental Music Catalogue). Hobbs was the teenage student who studied with Cardew and played with AMM, the Scratch Orchestra and the Promenade Theatre Orchestra (PTO). The PTO made music on toy pianos, reed organs and small percussion – a flyer once boasted: ‘NO noisy electronics… All musical material guaranteed through-composed. NO hit-or-miss improvisation’. 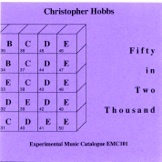 Fifty in Two Thousand is a 75-minute epic comprising 50 sections of equal duration, scored for five different combinations of two instruments – all played live by Hobbs. The work moves between quiet repetitive phrases for prepared piano and percussion to busy, Gamelan-like motifs for piano and digital synthesizer. The timbres are seductive and easy on the ear; the music’s presentation in 90-second chunks means that ‘the listener never has to deal with one kind of material for too long’ as Hobbs writes in his liner note. It is not to be mistaken for meandering, quasi-improvised chilling; the rigour of Hobbs’s compositional approach gives the piece substance and purpose, and an arithmetical structure you find in the best work of Peter Greenaway and Louis Andriessen.